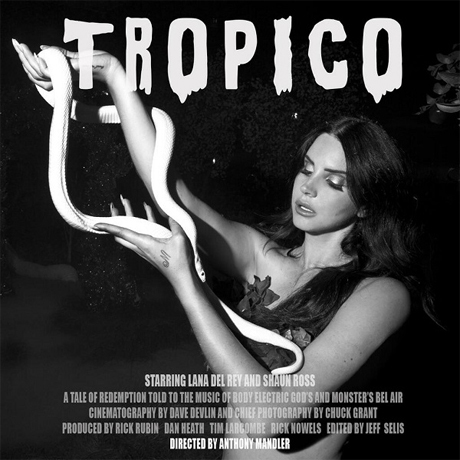 As promised, Lana Del Rey's 30-minute short film Tropico has hit the web today (December 5). The film, which was directed by Anthony Madler, offers up "an epic tale based on the biblical story of sin and redemption." The surreal, colourful flick sees Del Rey play the role of Eve. The whole thing also includes her songs "Gods and Monsters," "Bel Air" and "Body Electric," and was produced by Rick Rubin. Watch Tropico in full below. UPDATE: At a lunch event for Tropico in Hollywood, Del Rey revealed her next album will be called Ultraviolence.